BioWare has confirmed that there will be open world PvP. However, beyond the confirmation of its existence virtually all questions about both the scope and nature of open world PvP remain unanswered. Unfortunately, I think that there is a strong chance that we can expect an objective-based system not terribly dissimilar to that of World of Warcraft’s (WoW). In this system, players from opposing factions accomplish tasks that are similar to those found in WoW‘s battlegrounds. Sadly, this sort of system is fatally flawed. Even though it is “open world PvP” nothing about its open world existence particularly enhances it. In other games where open world PvP is a central feature, such as EVE Online or Darkfall Online, there are features of the environment external to just the combat which make their implementation of open world PvP meaningful. In EVE, player corporations (guilds) battle each other for control of entire solar systems and the manufacturing resources contained therein. Since battles often span entire regions of space the strategy that corporations must employ is altogether different than if they were fighting on just a tactical level. Similarly, in Darkfall, guilds fight for both player and computer-made cities as well as entire regions of land. Sieges against cities last for hours instead of minutes, and losing the battle could mean giving up large swathes of land. In the case of both EVE and Darkfall open world PvP is exciting because they are unforced engagement with large scopes and consequences. By contrast, in the case of the aforementioned WoW system, there is no advantage to open world PvP over instanced PvP such as arenas or battlegrounds. Furthermore, it is much more difficult to obtain a consistently enjoyable gaming experience in WoW type systems because sometimes there are simply not enough people playing! At least during instanced PvP the matchmaking system ensures that the teams are numerically even and that you even have enough people for a match. The design challenge of open world PvP seems to be that it is often devoid of meaning or consequence for the players involved. As such, instead of using an outdated WoW-esque system for open world PvP, BioWare should make open world PvP meaningful by calling upon several of TOR‘s central design premises. From the beginning the developers at BioWare have stated that they want TOR to be very epic and very much a Star Wars game. With respect to open world PvP one of the best ways to do this would be to have periodic (perhaps weekly or bi-weekly) open world PvP events. Obviously, these sort of events would have to be repeated as designing new events every single week is completely unfeasible. Nonetheless, there is a simple way to keep them fresh, exciting and unpredictable: involve game masters (GM) and/or developers. Imagine for instance, the Empire assaulting a Republic base led by GM coordinated assault vehicles whilst players from both sides clashed. Such events would be exciting for the players because something different would happen every week even if the venue did not always change. Their relative infrequency would also ensure that they were a meaningful and an economically viable option for BioWare (after all, GMs have to get paid). There are, of course, many design considerations to take into account such as overcrowding, what sorts of things the GMs can control and how they control them, etc. With a little effort all of these problems could be overcome. More importantly, the implementation of such a system would be in line with BioWare’s design goals in TOR: epic Star Wars-ness. I know that some readers will immediately wonder why we would want GMs running this type of event rather than players. The first and most obvious reason is that such a system has a huge potential for abuse and/or extreme negligence. A malicious commander (or one who simply has to leave his or her computer unexpectedly) would ruin the experience for both sides. In addition to abuse, designing a user friendly interface for such a system would be time consuming and costly. It would be much better for BioWare to design a more rudimentary system that GMs could use. GMs (presumably) are more tech savvy than the average video game player and as such would have no problems dealing with a less user friendly interface such as one based off of console commands. While some players would undoubtedly be able to handle that sort of interface, many, if not most, would not. Another important aspect of PvP which has not been addressed is the possibility of a ratings or rankings system for players. For the purposes of this article, when I speak of a ratings or ranking system, I mean two very different things. In a ratings system players are assigned a value based upon their strength relative to other players. Rankings on the other hand assign a rank which exists in a vacuum, independent of other players’ relative skill. For instance, let us say that it takes one-hundred and fifty PvP kills for a player to achieve the rank of “lieutenant.” Once the rank of lieutenant is earned, that player can never go down in rank, even if they get killed one million times by the opposing faction without ever getting another kill of their own. By contrast, in a ratings system, points are earned and lost by defeating or being defeated by other players. The ratings system is a substantially better and more complete system because it is an accurate measure of a player’s current skill level. The rankings system is also flawed in that eventually, even a very, very bad player can reach the highest rank if they commit enough time to the task. This diminishes the accomplishment of having a high rank and inhibits the ability of the computer to construct good matches. In chess (and now in many other competitive games) the ELO rating system is used to measure players’ relative skill level. As great as this system is, it is not entirely clear how such a system should be incorporated into an MMORPG such as TOR. The ELO system was originally designed for chess, which differs primarily from TOR in that chess “teams” consist of only one player per side. In TOR obviously there are multiple players involved in PvP combat which makes the original ELO system imperfect for the job of PvP rankings. However, the ELO system has been modified by other game designers via statistical weightings to account for the unique features of their respective of games. BioWare could incorporate such ratings to adjust for players being outnumbered, factor in contribution via damage, tanking and healing, etc. Whatever the specifics of the implementation might be, it is something that BioWare should seriously consider for its benefit to both PvP matchmaking and as a system of advancement for serious PvPers. Many of BioWare’s design decisions about TOR‘s game systems have been excellent thus far. We can only hope that this trend continues with regard to TOR‘s PvP. What do you think of these proposed systems? Are there any others that you would like to see in TOR? Let us know in the comments section or on the forums. I’ve already heard one of the devs say there is are pvp ranks, like in WAR. Seeing as how the designers for WAR are doing the PvP it makes sense that they did this. When talking about open world PvP how can you avoid mentioning DaoC and WAR, ecspecially sense Gabe has said that you will see similar features in TOR. Right, well I am glad that there are no rankings, but I would sure like a PvP rating system. If they don’t have one then I am fairly certain that they won’t have any skill based matchmaking built into the game either, which would be a shame. You’re right to bring up, at the very least, DaoC as a good example of open-world PvP. In fact, they’re the first game that developed RvR and the guys over at Mythic definitely deserve credit for that innovation. However, the DaoC system is a dinosaur in video game terms. It has been superseded by Darkfall, EVE and even Aion. I chose to focus on Darkfall and EVE over DaoC because of this. WAR I don’t think is ever worth talking about except as an example of what not to do in an MMORPG. Mythic really blew it with that game. They had a gold-plated IP with which to work as well as plenty of resources and a ready and waiting fanbase. What they tried to do was make WAR into a game that did anything and everything, but stretched themselves so thinly that they ended up making a game that did nothing well. Specifically, their open world PvP made the classic mistake of being both repetitive and meaningless. 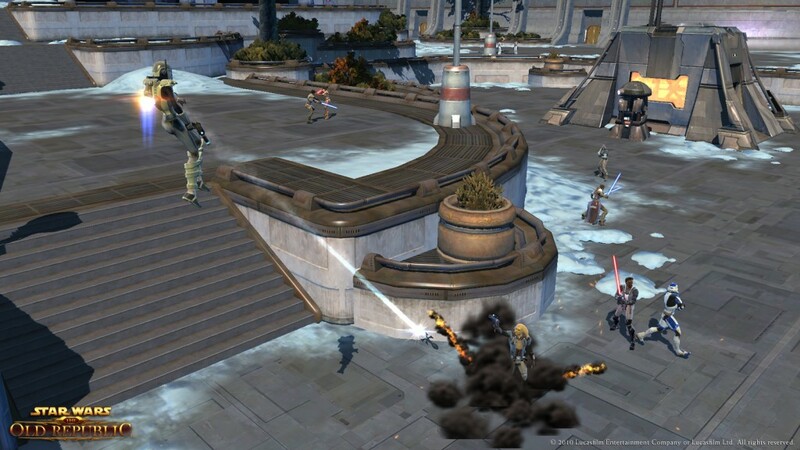 Have to agree, the PVP you are comparing this too are apples to SWTOR’s oranges. WAR might be a better comparison. Hoping for EVE like PVP is completely unrealistic. You need a sandbox game to have that kind of action, the same with Darkfall. Expect the WoW system with tweaks, or something like WAR. There definitely needs to be some kind of rating system otherwise it will take a lot of the fun out of PvP. For example, you get the group that play together all the time and are competitive versus a group that just plays now and then for fun. It would not be fair or fun for either side since one side would just get destroyed and the other side would have little to no challenge. They should definitely incorporate some kind of system to keep track of players skill and rank. On a side note I really liked the idea to have GM’s on both sides for a world PvP fight, that would be so awesome! The game is still not out yet so hopefully they add something in order to make it more fair and more fun. 🙂 Come on Bioware we are all counting on you to make this game amazing! They have said that pvp “lakes” will be in the game similar to those of WAR, but Gabe was specific in saying that it wasn’t RvR, but the lakes are there. This more or less tells us there will be objective based world pvp “lakes” in the game. That’s a good thing. I do wish we knew more about what these “lakes” have in them though. I would hope they add a rating system as well, or they would talk about a possible existing one more openly. I am using PvP as my watermark as to how effectively Bioware can adapt to developing and catering to audiences that they have not had to pay attention to in the past. I hope they do well. @Haroun: I didn’t say that I was hoping for PvP “like EVE,” I merely argued that any type of open world PvP needs to be implemented in such a way that it is meaningful. Darkfall and EVE are the two best examples where this is true. As I said in the article, the way in which I hope they make it meaningful is by making it an epic / GM guided experience. I fully realize that we cannot expect (nor would it be reasonable to expect) that we get the sort of free roaming / sandbox style of play that we have seen in other MMOs. The biggest problem with PvP in an MMORPG is you need to focus on either instanced PvP or open world PvP. You cant do both realistically. WAR sucked and the open world PvP was a joke. WoW is nothing but BG farming with no open world pvp. They both tried to have both open world PvP and BGs, but there was no point in doing the open world stuff. People were motivated to grind BGs all day because they wanted their free epics. A system similar to lineage 2 could work with castle sieges etc. Unfortunately ToR has BGs and that will become the thing to do for PvP. It will become a grind just like burning through instances over and over for loot. Just impliment some system where there are contested planets that give players access to resources, quests, raids, residential zones etc if they control it. Then people will flock to player cities etc to take them and gain control of the zone.